We know that in today’s busy world, flexibility is everything. That’s why we’ve been busy developing a new folding wall system which makes it even easier for you to tailor your space to suit your needs. This new, stylish system has the ability to transform your room layout in seconds with the minimum of fuss and the maximum impact. After being tried and thoroughly tested, it’s finally available and we can’t wait for you to see it in action. Where rooms need to work hard and fulfill a number of different functions, this innovative new system will make that transformation quick and simple, allowing you to set up a new layout in no time at all, and with little effort. Our new folding wall system consists of a series of hinged panels that are designed to run smoothly and effortlessly along a sleek floor track, with an optional top hung fitting. Hotels and conference centres – they’re the perfect solution where spaces need to be altered to suit different events and functions, perhaps on a daily or even hourly basis. Corporate offices – with their sleek design and smart styling they wouldn’t look out of place in even the smartest office setup. Where workspaces need to be flexible to accommodate hot desking or occasional meeting rooms, they’ll rise to the occasion beautifully. Hospitals – with a choice of finishes, our folding wall systems are equally at home in the medical environment and are a cost effective way of utilising the available space in the most efficient way. Schools, colleges and universities – we have extensive experience within the education sector, working closely with our clients to create great learning spaces that work for both the student and the institution. Our systems can even be supplied with a dry wipe surface, giving you two solutions for the price of one. Churches – with great sound reduction properties, our folding wall systems work extremely well in these settings and help to create separate, private spaces for a number of different uses. Sports and leisure facilities – these systems are the perfect addition in sports halls and gyms where areas need to be separated to run different classes or where large spaces need to be divided up for different sessions. Our new folding wall system has been designed with every care to ensure it looks good and performs even better. It’s made from the highest quality materials and is available in a wide range of options and finishes so you can choose the perfect system for your needs. Espagnolette bolts lock the panels into position both top and bottom so they fit neatly and securely. An aluminum floor track with a slim profile provides a smooth and reliable runner for the folding wall system. The overhead track and door jambs are all fully adjustable so you can be sure of achieving the perfect fit and operation. For a high quality finish and sleek design, we’ve incorporated SAA flush ring handles and stainless steel latches into our folding wall systems. If you also require extra locks, these can be supplied and fitted too. 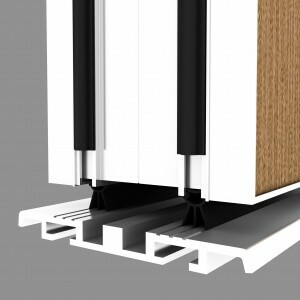 Rubber seals are fitted to the top, bottom and vertical edges of each panel and these ensure a high degree of sound insulation. With a panel thickness of 68mm and the benefit of rubber seals to all panel edges, an acoustic level of 38dB – 42dB can be achieved. At the higher end of the scale this means that even if someone were shouting on the other side of the wall, the noise would be audible but not distinguishable. All fixings are made from lightweight aluminium which also has the benefit of being extremely hard wearing. Panels come in a range of sizes to suit your application – right up to an individual panel width of 900mm. Door panels can be arranged so they stack at the end of the track or at the centre. Our folding wall systems can be supplied in either a single wing or a bi parting formation. To blend in with their surroundings, our door panels all come in a wide range of finishes including hardwood veneer, laminate, melamine, vinyl, fabric or even magnetic dry wipe. If required, single glazed or double glazed vision panels can be incorporated into your folding wall. Where fire safety standards are concerned, class B or class C surface spread of flame can be achieved. Whether you’re looking for a special finish or a special look, we’re sure to be able to deliver it for you. We offer a complete service from advice and initial design right through to the manufacture and installation of your system. Then once your folding wall is in place, we’re always available to ensure it keeps performing at its best, day in and day out. If you’d like to find out more about our new folding wall system or about any of the moveable walls or folding partitions available from Building Additions, just give us a call on 01373 45457. One of our knowledgeable and experienced team will be delighted to help you. This entry was posted in Building Additions News, Commercial, Education, Folding Partitions, Hospitals and Medical, Operable Walls on March 30, 2016 by Andy Ferris.